3T Quan Nuong (3T Quán Nướng) is a roof top Vietnamese Barbecue (BBQ) / Grilled restaurant. 3T Quan Nuong is located along Ton That Thiep Street, a 5 minutes walk away from Saigon Centre. It is located just next to Fanny Ice Cream. It was not easy getting to 3T Quan Nuong. When we saw Fanny Ice Cream, we were knew that 3T Quan Nuong was next door. But yet we could not find it, we had to ask the locals. We were directed to the right side of Fanny Ice Cream. 3T Quan Nuong was located above Temple Club (an upscale fine dining Vietnamese restaurant where Brad Pitt and Angelina JolieBrad Pitt and Angelina Jolie once dine at). Hence, if you are going to 3T Quan Nuong, look out for the Temple Club Signage instead. Once you located the building, you would need to walk pass a long narrow corridor which is dimly lighted to the stair case and proceed to the roof top. If we had not done any research before hand, we would not have walked through this corridor. It seemed sleazy and doggy! Tada, the reward! Open air roof top BBQ! About one third of the dining area was sheltered while the rest was not. I wonder what happens when it is the monsoon season (rainy season). When we reached at around 630pm on a weekday, the restaurant was not even half full. But by the time we left at around 8pm, the place was nearly full! We noticed that most of the customers were locals except for two other tables. 3T Quan Nuong had both Vietnamese and English menu available. I do wonder if there are any differences in price between both menus. Do note, not all the serving staff understand English. Whenever we had questions or wanted to order an item, they would always send a particular waiter who could speak and understand basic English.The staff were friendly and when they noticed we were foreigners, they would assist us and show us how to cook the food items. Ceramic tiles table with a grilling stove in the middle. Noticed the small container with a stick? It contain oil and the stick was actually the brush. You would need to oil the grill so that your food would not stick to it. We ordered a Cơm Trắng (Steamed Rice). It was served in a cute little ceramic 'pot'. As we did our research before hand, we knew what to order. The Tôm nướng muối ớt (Roasted Prawn with Salt and Chilli) was one of the highly raved about dish! 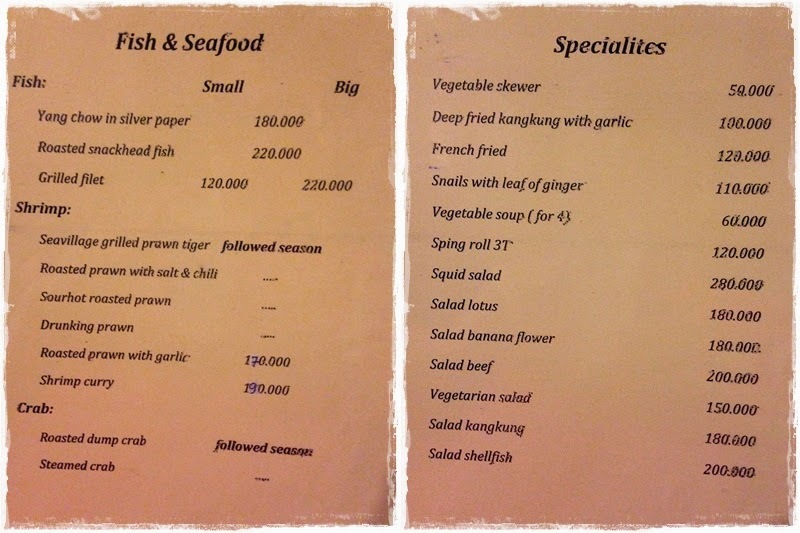 As there was only the two of us, we decided to order 100g (4 prawns) which cost 58,000 VND (S$3.50). The prawns were still alive when they were served on wooden skewers. Salt and chilli were sprinkled over it. These prawns were still alive as they were taken from the tanks full of prawns at the kitchen. To ensure the freshness, these prawns were taken out from the tanks only upon order. Brush some oil over the grill and you are ready to grill the live prawns. I know this is cruel.. as the prawns were put over the grill, they were still moving. Needless to say, the prawns were fresh. The shells came over so easily. In addition, the meat was firm and sweet. To further enhance the taste, squeeze the lime over the salt and chilli powder. Then dip the prawn into it. The different dimension in taste of the prawn, lime, salt and chilli was just out of the world! Top notch! This is a must try! Wish that we had ordered more! When the Roasted Beef with Honey was served, the waiter helped us to oil the metal grill again before helping us to put some of the beef meat onto the hot sizzling grill. The beef meat was delicious, but I can't detect any hint of honey if any. 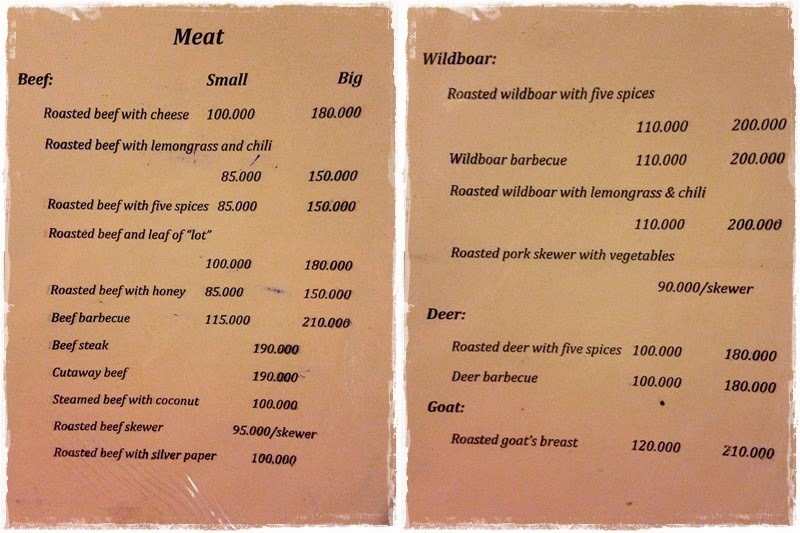 The Heo nướng sả ớt (Roasted Wildboar with Lemongrass and Chilli) which cost 110,000 VND (S$6.60) was served with a plate of salad. The Roasted Wild Boar with Lemongrass and Chilli was a little too tough. I wonder if its because of our 'cooking skill'. In short, this dish did not wow me. As we required some greens, we ordered a plate of Rau muống xào tỏi (Deep Fried Kangkong with Garlic) 100,000 VDN (S$6.00). It was well fried! The kang kong was crunchy and tasty. Do note that it was not deep fried as indicated in the menu. I was impressed that I could get such a decent dish in a Vietnamese restaurant. As we were enjoying our meal, a big group of around 15 locals arrived and ordered a whole lot of prawns! They requested for the staff to grill it for them. And the staff had to heat up two metal grills and spent a good 20 minutes grilling all the prawns! What great service! After the meal, the restaurant served us complimentary fruits (watermelon and pineapple) and tea. The highlight of the meal was definitely the Tôm nướng muối ớt (Roasted Prawn with Salt and Chilli)! The staff here were warm, friendly and attentive. They seemed to pay extra attention to tourist, coming over to assist and demonstrate how the cooking should be done, adjusting the temperature of the grill when it was too hot, helping to brush oil on the metal grill, changing of metal grills, etc. All the little things that matter! Do note, you would smell of BBQ food despite it being very windy at the roof top. Nevertheless, this was worth it! Ending off with a Instagram video (aka Instavideo) which I took.